Enchiladas are a classic baked tortilla dish that is usually filled with cheese, meat, veggies or beans and topped with a red, tomato/chili based sauce. This recipe uses chicken, a mixture of veggies and cheese, and is baked in a green tomatillo sauce. I like to use rotisserie chicken or leftover baked chicken and then throw in any cooked veggies I have on hand. Start out with onions and peppers and then add anything you like including zucchini, carrots, sweet potatoes, broccoli, spinach, kale, peas, beans, tofu, seitan. You can make this all veggie style with veggies and beans, or super meaty style with a mixture of chopped or shredded beef and pork. You can also add a mixture of cheeses like cheddar, pepper jack, goat or feta, and use fresh or store bought red enchilada sauce or green salsa verde. Pre heat the oven to 400 F and lightly oil a large casserole dish. Place the first 9 ingredients into a bowl and mix to combine. Place the tortillas on a flat surface, place 1/3 - 1/2 cup of filling in the middle and then roll tightly. Place the rolled tortilla into a large casserole dish, then continue to roll the tortillas with filling and pack tightly in the dish. Pour the green sauce over the enchiladas, top with cheese, cover tightly with foil and bake for 45 minutes. Remove the foil from the dish and cook for 15 minutes or until golden brown. 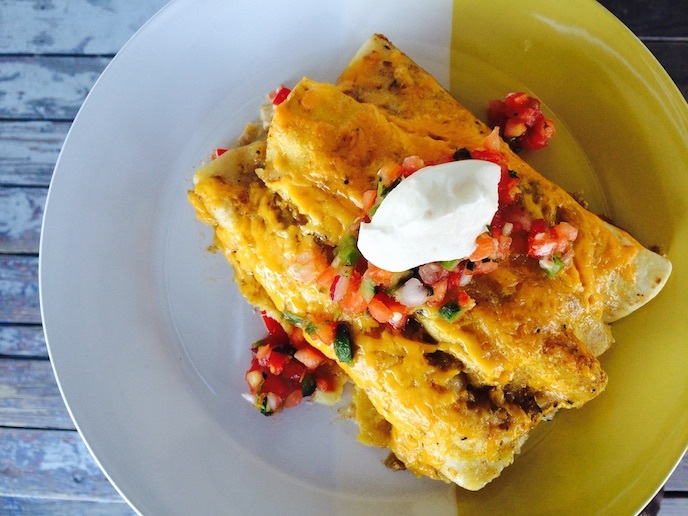 Serve the hot enchiladas with sour cream and fresh pico de gallo. Place a small pot over medium heat. Add the oil to the pot, and when it smokes, add the onions, garlic and jalapeño. Cook for 5 minutes, then add the tomatillos, chicken stock and seasonings. Stir the mixture and simmer the sauce for 15 minutes. Remove the sauce from the heat and carefully use a hand blender to pulse until smooth. If you do not have a hand blender, place 1 cup of the sauce into a blender at a time, top lightly with a towel and pulse on low power until smooth. Repeat with the rest of the sauce. 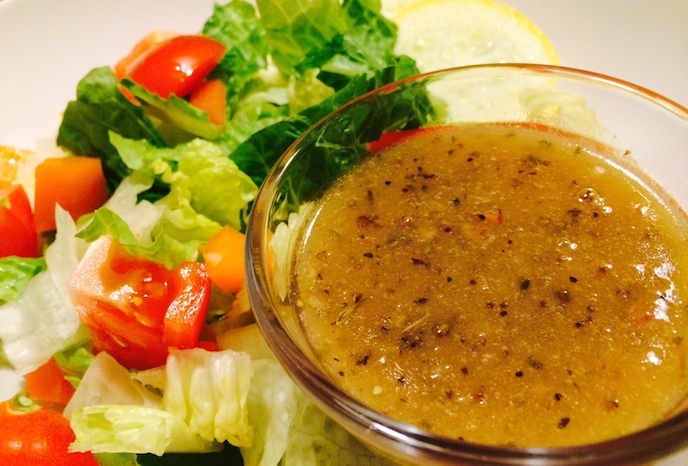 Homemade dressing is very awesome and extremely easy to make. With a couple of ingredients that you probably already have in your house, you can make a dressing to match an salad combination you can think of. First start out with an acid, like lemon juice or vinegar. 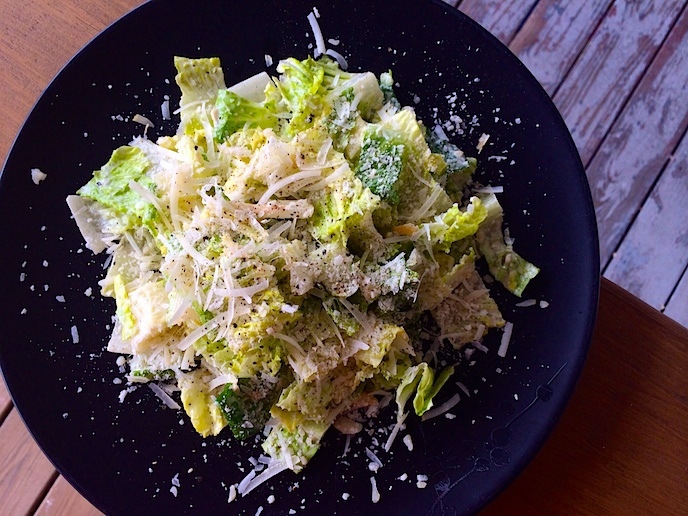 this is going to give your dressing the flavorful bite you are looking for. Next, you have to mellow out that bit with a little something sweet like honey, agave or maple syrup and even white or brown sugar, just a bit will do. Also, I like to add some minced shallots, which are little, sweet, French onion to the dressing to give some extra flavor. Now we will add some mustard. This ingredients acts as an "emulsifier" or as I like to call it "the friend maker". The mustard will add a boost of flavor but it will also combine the unlike ingredients - vinegar and olive oil - into one fantastic dressing. Whisk in a pinch of salt, pepper and dried herbs to give a further blast of flavor and then slowly whisk in the olive oil on little dribble at a time. You will notice that the dressing will start to become thick and rich as the oil combines with the vinegar and the mustard. Place the first 5 ingredients into a bowl and whisk to combine. Whisk in the olive oil very slowly until the dressing is thick. Season with more salt and pepper if you like and store in a sealed container. Place all of the ingredients into a bowl and toss to combine. Keep in the fridge in an airtight container until service. Place all ingredients into a bowl and mix to combine. Season with a pinch of salt and lots of fresh cracked pepper to taste. Place in a sealed container in the fridge to store. Place all ingredients into a bowl and toss to combine. Place your grill on medium heat. Grill the corn on all sides until lightly charred and then cool completly. Carefully slice the corn from the cobs with a small knife, then place all of the ingredients into a bowl and toss. Add salt and pepper to taste. Extras: Bell Peppers, Olives, Artichoke Hearts, Feta Cheese, Roasted Red Peppers, Peas, Asparagus, and Zucchini. Place all ingredient sin to a bowl and toss to combine. Pop in the fridge for 2 hours to marinate before serving. This is a great side to serve with grilled meats, fish, tofu, beans, grains and crusty bread. Salsa Roja aka "Red Sauce" is a thin tomato and chili based salsa from Mexico. The ingredients are charred in a dry hot skillet to give it a smokey flavor and is perfect for chip dipping and serving as a side. It goes well with all meals but especially with tacos, fish and chicken, quesadillas, sandwiches, fried eggs and hash browns. Place a large skillet over medium heat. Place the first 4 ingredients in the pan and char on all sides. Cool the veggies, add the lime and cilantro, place in a blender and pulse until chunky. Fresh pico de gallo and crispy tortilla chips are a perfect party pleaser. "Pico" unlike it's salsa counterpart is a chunkier, less watery, uncooked version of the standard mexican condiment. 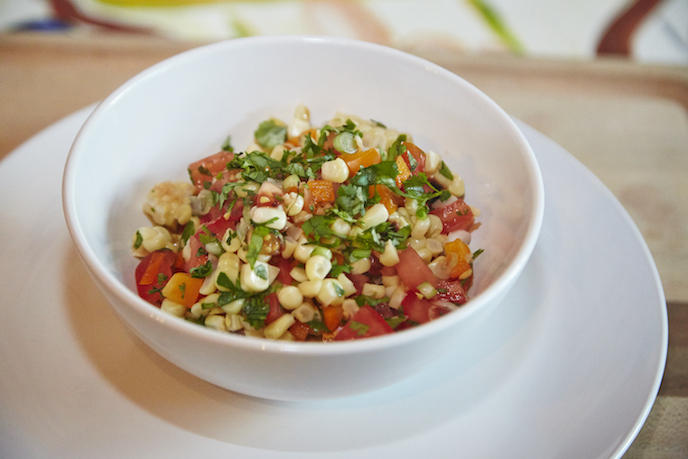 The ingredients represent the Mexican flag with its red tomato, white onion and green cilantro. Pico de gallo brings a fresh and vibrant flavor to any dish and is perfect for tacos, breakfast burritos, salads and topped on grilled fish, steak and chicken.